Welcome! We are excited to welcome Lincoln University young alumni to our official website for the Young Alumni Council. The purpose of this interest group is to join fellow alumni, from one to fifteen years post graduation, at events hosted in cities across the nation. From award banquets and dinners to happy hours and movie premieres, our robust schedule will entertain hundreds of young alumni every year. It is the perfect way to stay connected to Lincoln no matter where you live. The Lincoln University Young Alumni Council (LUYAC) will have affiliates in cities beginning this Fall 2014. 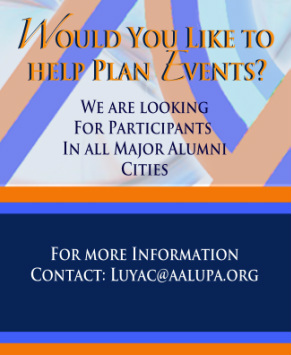 Connecting young Lincoln alumni in their respective regions enables LUYAC to bolster support for the Alumni Association of Lincoln University (AALU). We hope our website provides you with beneficial information and assists in the understanding that the Young Alumni Council is not only a benefit to Lincoln University; yet, it is also a means to unite Lincoln's young alum. If you have any questions or concerns or if you would like to volunteer to help out you can reach us at luyac@aalupa.org. Let’s work together to give back as we moved forward and advance the legacey of Lincoln University. Hail Hail Lincoln!